It’s a common misconception that eating locally grown and produced food means spending more. Shopping and saving at your local farmers market requires a different approach than the one you use at the grocery store, but with these tips it’s easy to start enjoying the benefits of eating local. Here’s how you can save money while shopping at your local farmers market. If you go to the market looking for something specific, you’ll likely be disappointed and end up spending more than you intended. Instead, “keep your mind open and just see what is available and then create a recipe based on what you get,” suggests shopper Brittany Haskell. My trusted resource for making the most of what I find at the farmers market is the cookbook From Asparagus to Zucchini: A Guide to Cooking Farm-Fresh Seasonal Produce. This handy guide has an alphabetical listing of common veggies with recipes, cooking and storage tips to help you make the most of whatever produce is fresh, available and inexpensive. There is nothing like a sweet strawberry in the middle of the winter, but health- and budget-wise it’s not the way to eat. Shopping locally forces you to learn about the seasonality of food. “Agricultural products are more expensive early or late in the season,” according to EatLocalGrown.com. Yes, yet another way your smartphone can help you save money! Not all your food needs to look perfect or pretty. “Check with the farms about seconds — vegetables that they would not sell to a restaurant, but would eat themselves,” suggests Cormier. You might have to cut off a few bruises, but your veggies will taste just as good as their prettier cousins. Purchasing in larger quantities also helps the pennies add up. The trick to buying in bulk is to make sure you have proper storage. “If you have an extra freezer, buying bulk meats and veggies from local farmers is an option,” says Cormier. A quick search on Craigslist pulls up a number of inexpensive local chest freezers, and Cormier also suggests investing in a vacuum sealer. Cash is king at your local farmers’ market, but apparently so are quarters, advises EatLocalGrown.com. Free food just for having a couple of coins? That’s not a bad deal at all. It’s all about who you know, and shopping locally is no exception to the rule. “Form a relationship with your local farmers and let them know that you’ll take any ‘need to sell quickly’ produce off their hands at a discounted price. Then use it right away or freeze. I often buy extra zucchini for bread and muffins,” Erin Chase of $5 Dinners told AllYou. Once you have a good connection with a farmer or two, see whether you can trade non-food items for your produce. The key here is to build a relationship first, before trying to barter — vendors may be less willing to barter with strangers. “Vendors often are willing to engage in old-fashioned bartering,” Kelly Thompson and Kasey Trenum of Time 2 Save told AllYou. 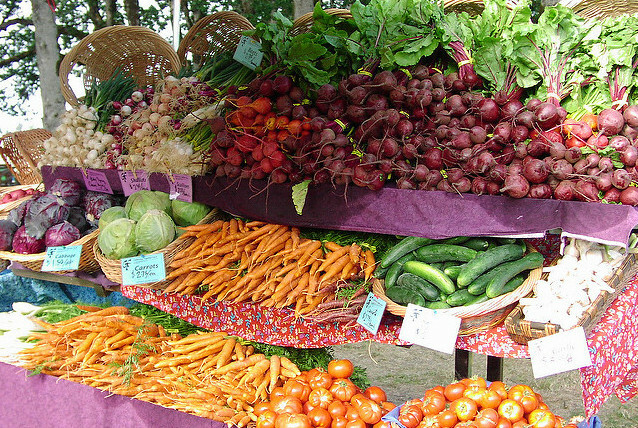 With such a short season, farmers markets are usually open rain or shine. “You can usually get great deals when the weather is bad,” suggests ValPak.com. Arriving late can be a bit of a gamble, but regular shoppers say they often find their best deals in the market’s last 30 minutes. “The selection won’t be as good and stands may be out of popular items, but vendors would often rather sell what’s left at a slightly reduced price than haul it home,” says Watson. By initially offering a set amount of money and giving the farmer a choice in what to sell you, the farmer will be inclined to give you both a good deal and the best of what his or her table has to offer. CSA is short for Community Supported Agriculture, another great option for adding more local produce to your diet. By joining a CSA, you agree to purchase a “share” of produce from a farmer over the course of the season and pick up new items weekly. “While you typically do have to pay upfront, the average share is about $30/week and you’ll have a bounty of fresh produce to enjoy,” says Cormier. When I was part of a CSA a few years ago, I purchased a half share for the season, saved a bundle and still had veggies to spare. Get started shopping local by checking out this directory to find a farmers market near you. Your Turn: Do you shop at farmers markets? What’s your best strategy to save money at the same time? Ally Piper is a writer, designer and marketing director. She loves to cook and eat local food and blogs about life, business and balance.